For every event that goes unanticipated, disrupts your business, changes your life, even reshapes an entire community or nation, there is always a lingering question: Should we have been more ready? Ready or not, disasters strike at any time. Being prepared for whatever might happen is key to business continuation. It is not uncommon for a business to fail after a catastrophe. Quick response, tough decisions, timelines, and consultation will all need to come together to get through the next 48-72 hours. That’s where SERVPRO of Lombard/Addison comes in. Our emergency response to a commercial loss proves that we are leaders in our field. Whether it is a loss that can be handled locally, or a loss that requires us to utilize our network of over 1,700 franchises that are ready for anything, businesses can be confident that they are getting the best in the business. Start developing your disaster plan today by calling SERVPRO of Lombard/Addison at 630-543-1700. Ask us about how we can help you be ready for when disaster strikes. Let us help your business be emergency ready. January 30th the temperatures dropped to -22*F. The frigid temperatures caused any standing water in pipes to freeze and expand in the pipes. The expansion created holes and cracks. While the temperatures stayed below zero, the water stayed frozen in the pipes and there were no visible issues. During the next few days, the temperatures rose gradually, therefore; the water in the pipes started to melt. The melting water found all the cracks and breaks in the pipes. SERVPRO of Lombard/Addison started receiving calls for broken pipes and water damage to homes as early as January 30th. Our crews worked extremely hard to keep up with the demand of our services. One of the best parts of SERVPRO is the ability to ask for help. We were able to call our “Storm Team” in. Our Storm Team consists of franchises from all over the country that can spare a crew or two to come help with our disaster. Our helping hands were able to assist with all calls that were going to our national call center while we were able to focus on customers that were calling our franchise directly. We can proudly say our crews at SERVPRO of Lombard/Addison helped over 13 families and businesses the next few weeks after the freeze. You can trust us to be there for you for any restoration and remediation needs. 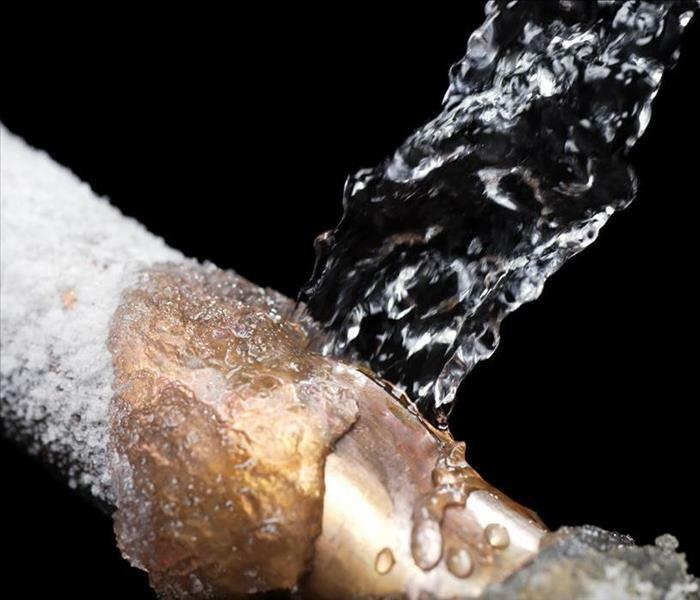 A frozen pipe can be identified by frost on the outside of the pipe or the water pressure is lower than normal! So, you have done everything you could to prevent frozen pipes, but your pipes still froze in this record-breaking weather. You do not have a burst pipe, yet. The frozen water could be preventing the water from flowing out or the ice has not expanded enough to crack the pipe. Here are a few tips to defrost them safely without a burst. Turn off the water that supplies that pipe or the water supply to the entire home. Call your local plumber if you have any questions. The plumber is a professional and knows how to properly defrost your pipes. If you are confident you can defrost them on your own you can use a hair dryer, space heater, or a heat lamp to slowly defrost the pipes. Wrap your pipes in temperature controlling tape. You can purchase this tape at a local hardware store. Do Not Use a propane torch or anything with an open flame. These pipes are typically hidden under cabinets. Using an open flame to defrost your pipes could be a huge fire risk. If there is a burst, the first person to call is your plumber. Your second call should be to SERVPRO of Lombard/Addison at 630-543-1700. We are available for emergency services 24/7. Once again, SERVPRO of Lombard/Addison has risen to the challenges of meeting our customers’ needs. During a mold remediation project for a school library, it was necessary to remove the only two heaters available in that room. Unfortunately, there was mold on the wall in that area and it was also known that the flooring underneath was positive for asbestos. Keeping in mind that we were already into December, the cold winter approaching dictated that we keep the room warm while the heaters were out of service. We brought in a Phoenix FireBird Compact 20 Electric Heater that offers powerful, safe on-demand heat. This machine provided continuous heat throughout the remediation and abatement project inside the library. The heater was used for over one month to ensure that heat was provided to the room as the weather outside turned colder. We were able to keep steady heat in the library, which was about a 1900 sq ft area. The heater is loaded with safety features and is fully NEC-compliant for continuous operation. We had peace of mind knowing that we were temporarily heating a building for a school while children and teachers were able to continue with their normal days. Had it not been for the safe heating method we were able to provide, the school schedule could have been disrupted. The temporary heater performed wonderfully during the entire project and the teachers and staff could not have been happier. Meeting the challenges of our customers’ needs is what we do. Once again, we were able to provide solutions and show our customers what it means to choose SERVPRO of Lombard/Addison. Ice damming and pipe bursts are the main cause of water damage during the winter months. Winter Storm Harper is on everyone’s minds. Will it hit us? How much snow will fall? If the wind is blowing a little south the storm could pass Chicago and its suburbs, but if the wind blows a little more northeast then Harper will lay a thick layer of snow on us. Whether the storm goes right through us or takes a small turn here are some winter tips to keep in mind. While shoveling, keep your feet hip-width apart. Bend your knees and keep you back straight. Do not twist or throw snow while shoveling. Instead walk the snow to a spot you want to put it. Only shovel small amounts of snow at a time. Shoveling is a hard exercise. Make sure you take plenty of breaks while shoveling. Heart attacks from over exertion are a major cause of winter deaths. Keep cabinet doors open especially in the kitchen and bathrooms. This allows the heat from the home keep those hidden pipes warm. Also, think about allowing a small trickle of water to flow out of the faucets. The continual movement of water prevents the water from freezing in the pipe. This could prevent a pipe burst. Make sure no furniture is blocking heat registers. This helps keep costs of heating your home a bit lower while keeping the pipes from freezing as well. Avoid ice damming! 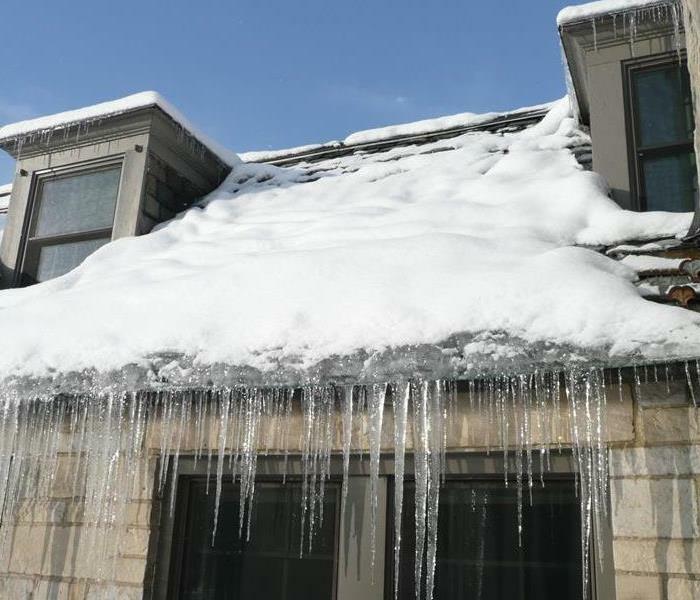 Ice damming is when the snow melts off your warm roof and refreezes in the gutters. Ice damming leads to the water soaking into the home creating water damage. To avoid ice dams, insulate the attic floor to prevent the heat of the home escaping through the roof. Also, having a water-repellent membrane installed under your roof can prevent water intrusion even if ice damming occurs. Only drive if absolutely necessary. Don’t travel alone, or let others know when you leave and when you expect to arrive at your destination. Keep you gas tank full. Also, make sure your antifreeze, windshield wiper fluid, and other fluids are full. In case you get stuck somewhere you want to be able to use your car to keep you warm. You should always have a blanket, extra gloves, bottled water, a first aid kit, and a flashlight in your car just in case you are in an accident and there is no one to come help immediately. These tips are handy whether the storm lands 12 inches of snow or only a quarter of an inch. Use your better judgment when driving and shoveling. Also, make sure you are consistently checking the news for weather updates. Our Crew Chief, David, is happy he got his certification renewed this year! When a disaster strikes, the last problem you want is to worry about the people coming in and out of your home. SERVPRO of Lombard/Addison has taken the proper steps to ensure you have the safest and most qualified crew performing services in your home or business located in Lombard, Addison, Villa Park, Glen Ellyn, and Oakbrook Terrace. Our employees are IICRC certified (Institute of Inspection Cleaning and Restoration Certificate). 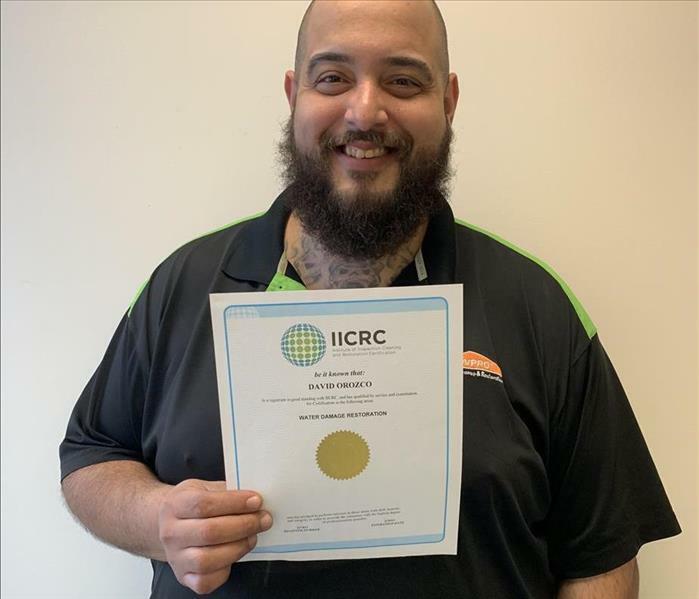 An IICRC certification requires attendance to a 3 day course where they learn how to properly inspect and restore any damage caused by water, sewer back-ups, and contamination like mold. All the employees have a background check done upon hiring and annually. We want you to be able to focus on getting your home restored rather than stress about the people doing the work. SERVPRO has been restoring homes and businesses after water, fire, and mold damage for over 50 years. We have the experience and resources to help with any disaster. 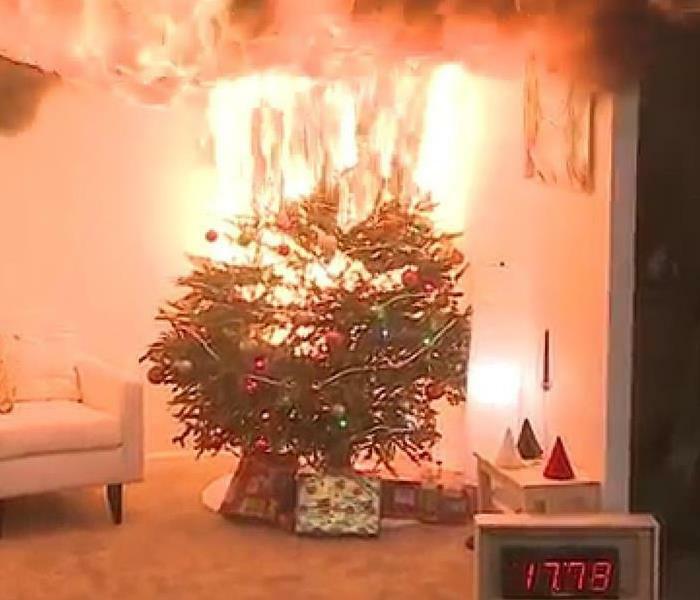 A Christmas tree 17 seconds after catching on fire. Now that the holidays are upon us, we will start getting ready by decorating the house! Some families go to the store and purchase a new, artificial tree, some take their artificial tree out of storage, and some run out and purchase a fresh, real tree. Whether the tree is real or artificial they both propose fire hazards. Before even bringing a tree home, there are steps to make sure the tree is going to be as safe as possible. If you have chosen an artificial tree, look for “fire resistant” or “flame retardant” on the labels. These phrases tell you the tree is less likely to catch on fire than artificial trees that are not advertising these phrases. While going out and searching for a live tree, you need to make sure the tree is not already dried-out. A dried-out tree will catch on fire much faster than any other kind of tree. To check if the tree is dried out give it a small shake and see how many needles fall out. A well-watered tree will have a few needles fall out, but a dried-out tree will have many needles fall out. Once you have chosen a real tree, you will need to keep the tree watered. There are stands that are made specifically to hold water. Experts say to check every day on the amount of water in the stand. A video has gone viral of a tree that isn’t watered catching fire and burning down within seconds. The watered tree takes a few minutes to fully catch aflame. So, remember when you are picking out a tree to do your research and keep your home as safe as possible this holiday season! 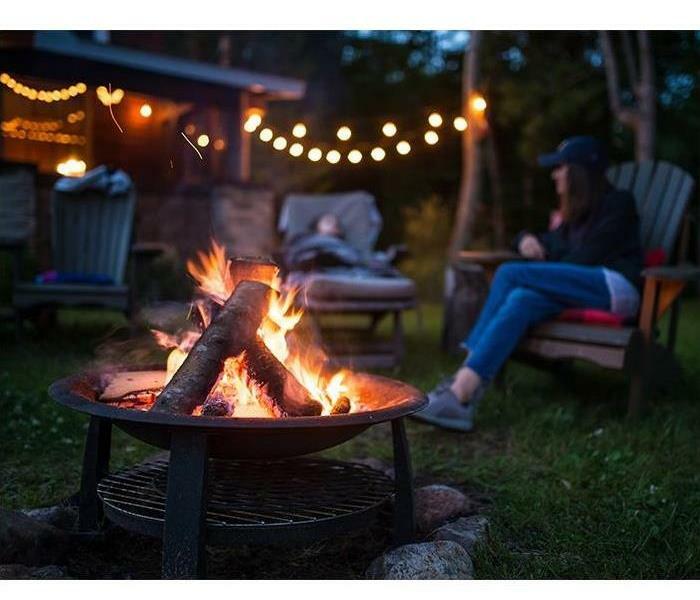 Stay safe this fall with these bonfire tips. Before starting the fire make sure the weather is good for a bonfire. Weather conditions that are too windy could create risks such as blowing sparks around. Once the weather conditions are good you can light the fire. When lighting the fire, an accelerant should never be used. Using gas or lighter fluid could cause a loss of control of the fire. Start with lighting small crumbled paper pieces and small sticks. From there you can add larger pieces of wood. It never hurts to have a fire extinguisher nearby in case of any accidents. If you do not have a fire extinguisher, try keeping a hose handy or a bucket of sand. Sand will effectively put out a fire. Throughout the night there are a few things to keep an eye on. Look out for too much alcohol consumption, watch children trying to get too close, and monitor pets sneaking towards the fire. When the night is coming to an end and the fire has burned down, use a metal shovel to spread out the ashes so they can cool down faster. You can pour water or sand on the ashes to get rid of the remaining embers. Remove the ashes and place them in a designated metal can used for ash storage only. Why is SERVPRO the best restoration company? There are many reasons SERVPRO is the best, but the most important reason is we make our customers a priority. We have a system set up we call 1-4-8. Within 1 hour of the initial phone call our SERVPRO Franchise will be in contact with the customer to arrange for services. Within 4 hours of the initial call our Franchise will be on site to start work. Then, within 8 hours of onsite arrival we will inform the customer and adjuster the scope of work. This insures we are in communication with the customer, adjuster, and insurance agents throughout the entire mitigation process and everyone fully understands the scope of work to be performed. Since our response is so timely and we are open 24/7 we can reduce the chances of secondary damages such as mold. Mold can grow in as little as 24 hours if the environment is right. Which means during a water loss every hour is precious. There's Mold in the Air...Conditioner! 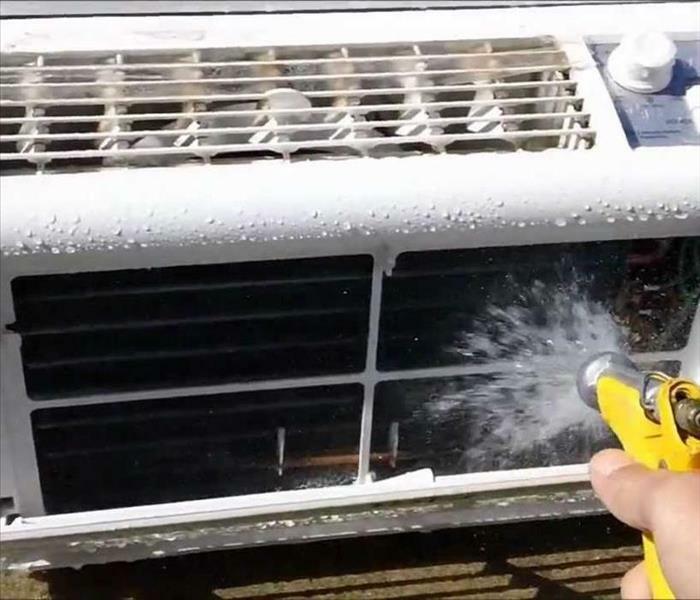 Don't be afraid to get your AC unit wet while cleaning it! They are typically water resistant. We advise to keep the water away from the controls. Have you noticed a smell but can’t quite put your finger on where it is coming from? When was the last time you checked your AC units? Mold thrives any place there is moisture. Whether you can clean the unit yourself or need a replacement will be determined by where the mold is located. A few steps can be taken to inspect and clean your AC unit. First, unplug and remove the unit from the window. Second, remove the filter and allow to soak in hot soapy water. Third, remove the outside pieces of your unit. Be sure to follow your owner’s manual. Once you have access to the inside of the AC unit, vacuum to remove any built-up debris and dust. Fourth, make sure the coils are clean. This is a step you cannot skip because the built-up residue will provide a food source for mold. Fifth, after you know the coils are clean, you will need to wipe down the entire inside of the unit to wipe away any visible mold. Sixth, spray the inside of the unit with Concrobium. This product can be found at any store that sells home improvement goods. After allowing the filter to soak through all the other steps, make sure to wipe down the filter and remove any leftover residues. The seventh and final step is to allow the AC unit to dry completely before assembling it back together. If you take apart the unit and find it saturated with mold, replacing the whole unit could be the safest option for you and your family. A common mistake people make is turning off the AC completely before leaving the home for a few days. This can lead to mold growth because the stagnant air promotes its growth. Instead of turning the AC off completely, set the temperature up 10 degrees higher than you would normally have it. This will keep the unit running every once in a while to prevent the environment where mold will grow. 4/10/2019 - Don't Skip This Commercial! 10/10/2018 - There's Mold in the Air...Conditioner!